Types of cactuses: how house cactuses are called? Flowers anturium: how to look after? The sort of ampelous plants under the name stefanotis totals no more than 12 types. One of them is the jasmine Madagascar. 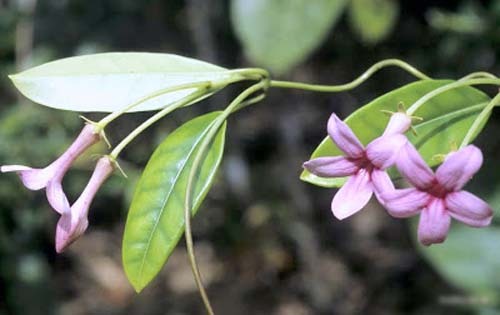 Stalks at a liana powerful with leathery leaves reach 5 meters in the nature. In room culture stefanotis, tie up to graceful arch support. Grow up a jasmine for the sake of beautiful flowers. Wax snow-white nimbuses with the unbent petals exhale magic aroma. And flowers are located not odinochno, and the whole clusters: on five or seven pieces. After the plant gained popularity in many countries, its began to use for drawing up bouquets. Flowers at brides enjoy special popularity. Healthy adult lianas blossom on an extent of four months. At change of temperature condition, it is possible to postpone this process to cold winter months. 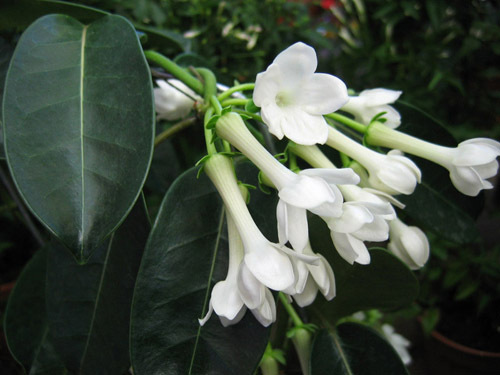 The Madagascar jasmine, stefanotis Floribunda and obilnotsvetushchiya is the same plant demanding care and attention. The liana needs bright, but indirect light, and both in the summer, and in the winter. Best of all approach for this purpose coming to the East or the West of a window. In cold time additional lighting will be required. When buds are put, the plant cannot be turned and rearranged on other place. The most suitable temperature for cultivation of a stefanotis in house conditions are +18+22 °C. In winter time of +14+16 °C. It is necessary to protect a flower from draft and differences of temperatures. To create humidity of air, necessary for a stefanotis, the plant is sprayed regularly. Water has to be otstoyanny and warm. It is also possible to put the container in the pallet with the moistened expanded clay. In the winter, at the cool contents, spraying is reduced to a minimum. It is necessary to water a houseplant plentifully and regularly. After the top layer of a substratum dries. Water should be banished via the filter and to defend to reduce the content of lime which badly transfers stefanotis. In the winter the liana is watered moderately for stimulation of plentiful blossoming in the future. 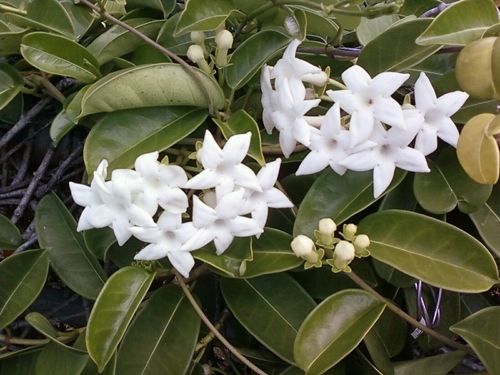 Are necessary for a jasmine top dressing by potassium which need to be brought disposable at the beginning of May. It is better to refuse nitrogen as it promotes building of green material and the mortgaging of buds oppresses. Before replacing a plant, we do cutting. The most suitable term for this purpose - the end of winter. For cultivation of a stefanotis we take a big pot, we do a drainage, we insert a support and only then we land a liana. We powder with the earth which consists of clay and cespitose mix (2), deciduous (3), sand (1) and humus (1). This surprising plant is made multiple copies seeds or shanks. To grow up it in house conditions it is rather difficult. Shanks can not take root, it is necessary to use growth factors, and seeds can not ascend at all. 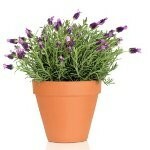 As well as many other houseplants, stefanotis shanks breeds when using healthy escapes. We do a cut lower than a knot on a plant and we land to the soil. For acceleration of process it is necessary to watch temperature indoors, it should not exceed +25 degrees. In 2-3 weeks there can be roots at shanks. But replace separately only when there are leaves and escapes. Place them to the light room. This plant rather whimsical. 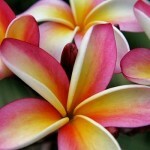 Only the correct leaving, regular watering and a prishchipyvaniye will provide plentiful blossoming. Good lighting and absence of drafts - pledge of rapid growth of a stefanotis. It is worth watering with otstoyanny cool water, plentifully and regularly that soil always was damp. Leaves need to be sprayed regularly. For this plant during the winter period to throw off the leaves the normal phenomenon. They turn yellow and fall down, even the part of escapes can dry up. You should not panic. It is normal, natural process. In the spring from pazushny kidneys there will be young sprouts.